One of the most genius ideas ever for summer skincare was spray-on sunscreen. Sure, it’s a little more expensive than the regular lotion, but it’s also made applying sunscreen way easier, faster and a lot less messy. And to be honest, maybe even a little more fun. I just always wished it wasn’t something I only used seasonally. I’m always looking for different ways to speed up a daily routine, whether that be with makeup, hair, commuting to work, etc. Life hacks are IN – and thankfully Vaseline caught on. 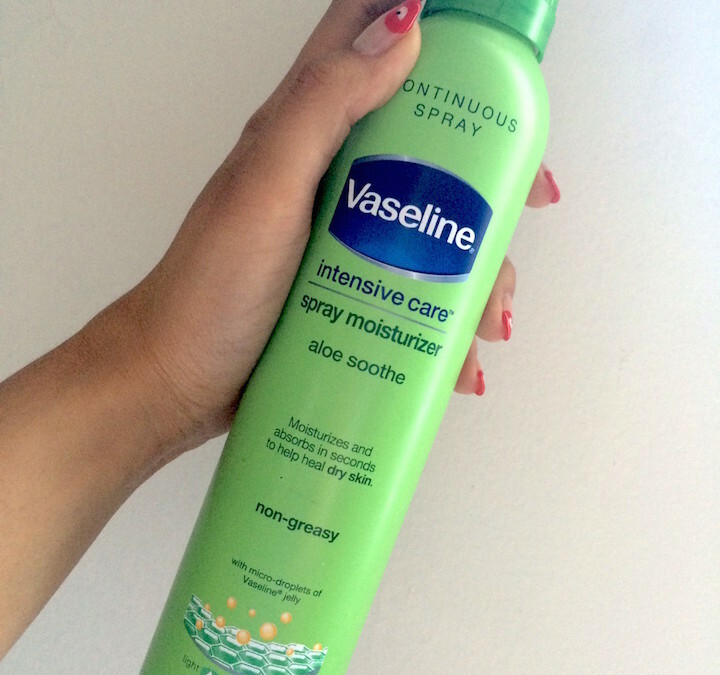 With Vaseline Intensive Care Aloe Fresh Spray, applying lotion more efficiently isn’t just limited to summer anymore. My time spent moisturizing my entire body post-shower just got cut down to a minute or two. The non-greasy (!!!) formula absorbs quickly into my skin, leaving my skin soft without residue or stickiness. Its spray functionality allows for an easy and even distribution of moisturizer. You can even spray it upside down for your back and the backs of legs. It contains micro-droplets of Vaseline jelly – which by the way, I’ve LIVED on since I was a baby. The aloe leaves my skin feeling and smelling super clean. I’ve been using this spray every single day since LC handed it to me two months ago to test, and it’s been doing some serious quenching to my dry winter-into-spring skin. I mean, for $5.99 at Target, I couldn’t be happier with the amazing deal I’m getting in exchange for smooth, hydrated summer legs. Really, get in on this, divas. Note: This post is not sponsored. Products were given for review, and all thoughts are unbiased and my own.